Saints wing George North has been named on the 15-man longlist for the EPCR European player of the year prize. North is one of only four current Aviva Premiership players present, with Bath centre Jonathan Joseph and Saracens duo Chris Ashton and Billy Vunipola also included. Nine of the men currently ply their trade in France, with Englishmen Steffon Armitage, of Toulon, and Nick Abendanon, of Clermont Auvergne, among them. 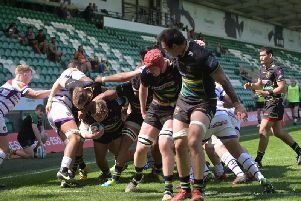 Saints’ Champions Cup quarter-final opponents Clermont have four players on the list, with Abendanon joined by Fritz Lee, Camille Lopez and Aurélien Rougerie. Wales star North, who is this season’s Champions Cup top scorer with seven tries to his name, was nominated last year but missed out on the award to Armitage. EPCR European player of the year 2015 longlist: Nick Abendanon (ASM Clermont Auvergne), Steffon Armitage (RC Toulon), Chris Ashton (Saracens), Jamie Heaslip (Leinster Rugby), Juan Imhoff (Racing Metro 92), Jonathan Joseph (Bath Rugby), Fritz Lee (ASM Clermont Auvergne), Camille Lopez (ASM Clermont Auvergne), Ian Madigan (Leinster Rugby), George North (Saints), Jamie Roberts (Racing Metro 92), Aurélien Rougerie (ASM Clermont Auvergne), Nicolas Sanchez (RC Toulon), Dimitri Szarzewski (Racing Metro 92), Billy Vunipola (Saracens).